I don’t know about you, but in my daily travels, I come across a lot of people who merit a savage dressing-down. Most of the time, I’m up to the task, believe you me. But on occasion, the wit well runs a bit dry. And nothing’s more embarrassing than facing down someone in need of a well-crafted insult with nothing more than an “Oh, yeah?” or a “Same to you, buddy” in your arsenal. But why struggle to come up with appropriate insults when William Shakespeare has done all the work for you? 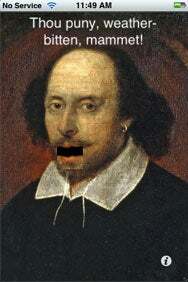 That’s the idea behind Official Shakespeare Audio Insulter from CHS Systems. The $1 app is an iPhone spin on the Shakespearean insult generators you’ll find on the Internet. This app’s distinguish feature: the insults take on spoken form. Just touch the picture of The Bard and stand back as he denounces you as a goatish, weather-bitten clotpole (in an accent that clearly did not originate in Stratford-on-Avon). Because of the audio aspect, the Insulter app works best on iPhones and second-generation iPod touches; the developer says first-generation iPod touch owners will need a pair of headphones to hear Shakespeare’s timeless words of abuse. SmartRSS2, from Visuamobile: The $2 RSS reader touts a 3D Touch Viewer feature that shows animated feeds on your iPhone or iPod touch. Washington Metro Subway, from Presselite: The mobile guide and trip planner for Washington, D.C.’s subway system is currently priced at $1, thanks to this week’s presidential inauguration. Smart Cards, from Wright Software: This $2 flash card app features 24 decks for mastering addition, subtraction, multiplication, and division. Parking App, from cgCraft: The $3 app includes a parking meter timer and a way to store parking zones to help you avoid parking tickets. Pixi, from Tiny Wonder Studios: The $2 app offers interactive animated designs you can manipulate with finger gestures. Blood Sugar Diabetes Control, from G.P. Imports: The $1 app helps you track glucose levels and record medication intake. Nearest Pubs, from Phil Endecott: The $1 navigation tool uses the location features in the iPhone and iPod touch to find the nearest pubs from a database of 35,000 establishments. Fliq Tasks, from Mark/Space: The free productivity tool manages to-dos and lets you send tasks over a Wi-Fi network to other Fliq users. Present.ly, from Intridea: The free social-networking app is a microblogging client aimed at businesses.